If Mario Puzo and Jane Austen crossed the time-space continuum and mated, “First, I Love You” would be their literary baby. Imagine being a detective with a mobster for a father, or a mobster with a straight arrow, good cop for a son. This is a relationship that is tricky on its best day. Add in some well-meaning meddling from a mob princess sister, an arrogant DEA agent, and gangsters running a human trafficking ring and you have a recipe for a book that refuses to follow the rules. Told from the perspective and point of view of each the six main characters this is the first novel in a trilogy about love, loyalty, revenge and redemption. Omaha Detective Tommy Gates has kept his gangster father at arm’s length his whole life. Mickey Downey has spent the better part of the last two decades trying to find ways to get back the son he lost through Witness Protection. Now Tommy has taken an opportunity to work on a Federal Human Trafficking Joint Task Force in Chicago where his father lives. Tommy’s sister Kiki and his mother Mary see this as an opportunity to build a relationship between the two. Tommy’s new DEA partner James Hoffman sees it as an opportunity to gain leverage over Mickey Downey. Tommy’s other partner, FBI Agent Ginny Sommers wants to keep Tommy’s family as far from the case as possible. When Kiki and James join forces, sparks fly and it sets fire to a maelstrom of unexpected consequences for everyone involved. One part The Godfather, two parts Emma and a dash of Casablanca mixed together, “First, I Love You” isn’t a detective novel, a gangster novel, a mystery, a romance or a family saga. It’s a little of all of the above. “…for there is nothing so perfect as a thing with no ending and no beginning such as a family of souls intertwined…” This introspective sequel to First, I Love You takes you deeper into a tale of interwoven roles, divided loyalties, and personal conflicts. Detective Tommy Gates and Agent Ginny Sommers struggle to balance their growing personal relationship with their task of finding his father. Back home, Kiki Downey and James Hoffman are facing their own internal and external pressures. After Mary Gates is led on a different trail by Mickey’s Irish kin, they are all given pieces of a puzzle that it will take the whole family to solve. Interlocked within the narrative are glimpses into how Mickey Downey became the man he is today. Throughout their journeys, past and present, they all must struggle with what loyalties and loves come first, and what comes… second of all. Tommy’s favorite thing to do after school was cut through the park and play Hunt the Bad Guys in the baseball diamond. He’d walk straight to Aunt Claire’s house like he was supposed to, wait for his mother to call and check on him before she left for her other job, then sneak out while Claire watched her soap opera. Mama would freak if she knew he was wandering around alone—Omaha was by far the biggest town they had lived in so far—but the way Tommy saw it, he was only a couple weeks from turning ten. And once you hit the double digits, you were practically an adult. He always began his game by sneaking behind the man-sized trunks of the cottonwood trees nearby and ambushing the bad guys that were after him and his mom with a gun he’d made out of wood and rubber bands. Then he would run a Coke bottle along the fence and imagine the chink-chink-chink was the sound of prison bars closing. There was weeping and teeth gnashing and the classic ‘I would’ve gotten away with it if it hadn’t been for him!’. The grand finish was pretending the snow-like seeds in the air were confetti celebrating his victory over the bad guys. He was never a cop or anything like that, though, in this game. Just a regular kid. That was why they were throwing the party, because he was a kid hero. And Mama would say, “That’s my little man!” and the kids would have to stop teasing him. In his mind, the bad guys often had the amalgamated faces of the boys who teased him. Ironically, it was the one constant in his life, other than Mama and Uncle Jack. Everywhere they lived, there were always bullies who taunted him about his run down, out-of-date clothes and having no family. The best part was after Tommy’s victory over the bad guys, his father would come out of hiding—because he wasn’t really dead—and he’d bring with him a whole score of aunts and uncles and cousins and Tommy would have a big boisterous family like Aunt Claire had. Uncle Jack always joked that the Andersons had made an Olympic sport out of having children, so they did their part as Underwoods by not having any. Tommy reckoned he just said that to take Aunt Claire’s mind off the fact she couldn’t have her own kids. But Tommy figured there’d be nothing more fantastic than having a big family because it meant he’d never be alone. There’d always be someone he could count on wherever he went. He was laying in the browning grass watching the fluffy white clouds glide behind the water tower when he heard the tell-tale crunch of leaves. He grabbed the rubber-band gun and rolled over like soldiers did in the movies. In front of him was a boy a few years older than Tommy in a Catholic school uniform. He had neatly combed brown hair and a big grin. “Oh, sorry, didn’t mean to scare you. Aunt Claire told me to come look for you,” the cheerfully bored-looking boy said. Tommy always figured ‘cheerfully bored’ was the best way to describe that type of person that never seemed to mind having nothing to do. This kid was one of Aunt Claire’s many nephews and nieces that came to visit from time-to-time. Tommy couldn’t remember what his name was… something with a ‘K’. “I’m Kyle, remember? From the picnic on Sunday?” Kyle said then flopped down on the ground next to Tommy, head on his crossed arms. Tommy stared in stunned silence for a moment then mirrored his body language. “What a pain,” Tommy said, but really, he figured it would be neat to have a pesky little sister. “I’m going to play professional hockey,” Tommy said. This was the nicest any kid had been to him in the four months they had lived here and he wondered how long it would last. He hoped this was one of those Anderson kids that lived nearby in Ashland. It really was hard to keep them all straight. It’d be nice to think he could finally have a friend, even if it was just a sometimes friend. Kyle nodded his head a few times on his arms. Tommy pressed his lips together and glared at the letters on the water tower until they merged a bit. “He died. He was in the military,” Tommy finally said. He had made that one up on the first day of school. He figured with Offutt Air Force base south of town people would buy it pretty easy. The truth was he had no idea how his dad died or what he had done for a living or even what his name was. Mama refused to talk about him. Tommy figured it had something to do with the bad guys that made them be on the run. He liked to imagine his dad had died a hero protecting them, like somebody in the military would. So that was going to be his story as long as they lived here. “Kyyyyyyle,” a girlish voice called out. As they cut across the park towards the Underwood house Tommy felt a shiver cross his body. He stopped and looked over his shoulder. He scanned up and down the park but it was just kids and moms and parked cars. He figured he was just beginning to get as paranoid as Mama was so he shook it off with a laugh and jogged to catch up to Kyle and Motor Mouth. Tommy’s relief at Kyle’s welcoming smile and the idea he might have made a new friend had him on cloud nine all the way home. It also caused him to miss the Rolls Royce that pulled away from the curb and followed them there. Copyright 2013 by Genevieve Dewey, All Rights Reserved. 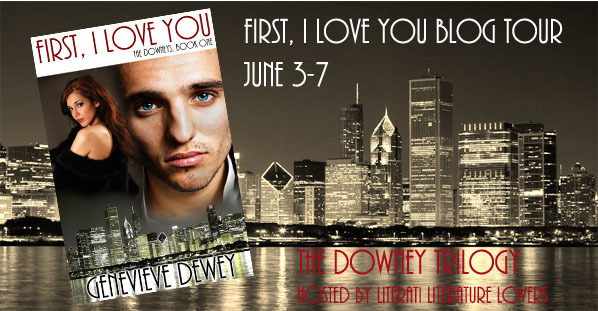 Genevieve Dewey is the author of The Downey Trilogy (First, I Love You & Second of All) and the short stories Bird Day Battalion & V-Day Aversion. She is a wife, mother, sister, friend and Anthropologist. She was raised mostly in Nebraska, partly in Arizona. She has a Master’s in Anthropology and worked as an Applied Anthropologist for years (even ran her own research company for a while) before deciding to be a stay at home mom. She loves passionate (rational) debates, reading, and libraries… oh, and Chicago and high-heels and chocolate and target practice and gangster flicks and anything with the FBI in it and run-on sentences. 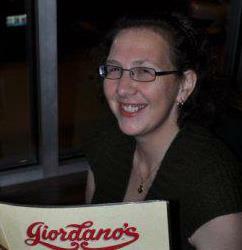 She lives in Nebraska with her three brilliantly diabolical children and one incredibly funny husband.